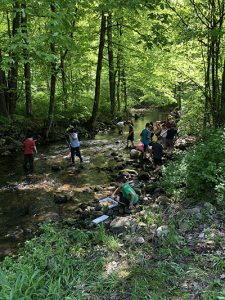 Cornwall Consolidated School students got a new perspective on rivers and the water cycle in an afternoon of activities led by HVA’s Alison Dixon. The lesson started with the children using the power of their boundless imaginations to magically transform into water droplets that moved through stations representing phases of the water cycle – from ocean to clouds to rain to the soil to rivers and back to the sea (with a brief stop inside some thirsty animals). 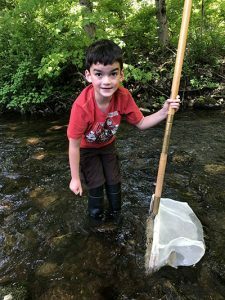 Having experienced life as a water droplet, they were then ready to don wading boots and kick-nets and go exploring the creek adjacent to the school – uncovering dozens of different species of “water bugs” (caddisfly, mayflies, riffle bugs, water pennies), juvenile trout, and everyone’s favorite… some very large crayfish! Students classified their critters based on pollution tolerance and made a prediction about the quality of the water based on their findings (it’s very clean!). Volunteers from National Iron Bank, a sponsor of HVA’s River Smart program, helped guide the kids along the way. Bringing kids outside for hands-on lessons showcases the power of place-based learning. 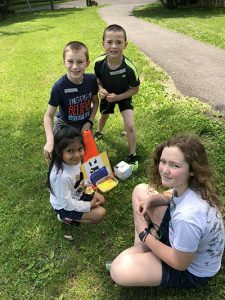 Place-based education increases students’ sense of stewardship and environmental consciousness and strengthens their attachment to the community. 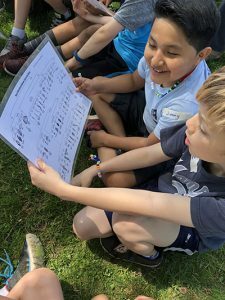 Experiences outside of the classroom help kids connect textbook learning to the world around them. You bring outdoor experiences like this to over 1,000 students throughout the watershed every year! Bonus: OH YES, we did the Insect Dance! Support outdoor education in our watershed!